Swift has considerably streamlined its portfolio for 2018, but if you think that means less models you’d be wrong. 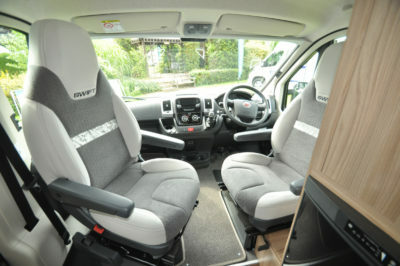 The Autocruise name that’s been used for its van conversions in recent years, for example, has been dropped and all models are now called Swift Select. 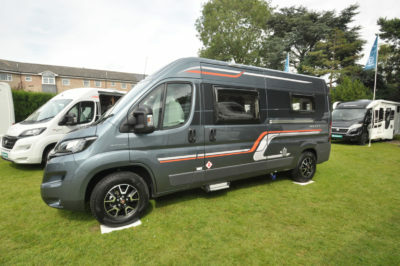 The 122 is the baby of the four-model range, being based on the 6m long version of Fiat’s Ducato. 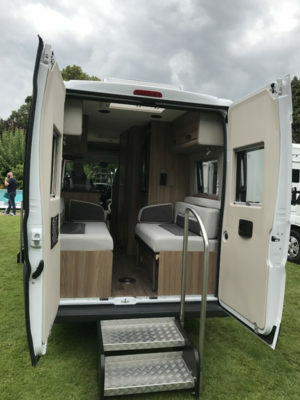 It’s a straight two-berth format, with its two-settee rear lounge and centre washroom and kitchen – definitely a floorplan that goes down well here in the UK. 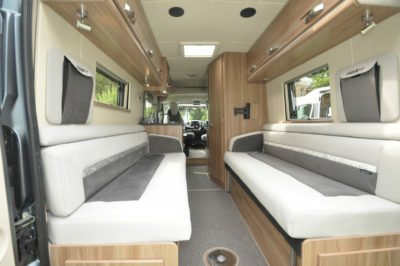 As a high-top van conversion, see it as a step up from a campervan, particularly in terms of its cooking and washing facilities, as well as overall storage and living space. 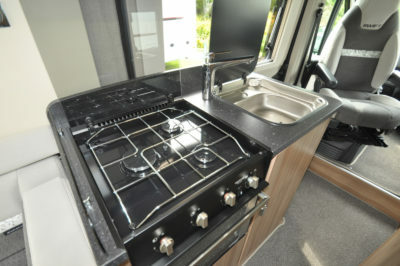 The kitchen unit on the nearside is home to a Triplex cooker, with three-ring hob and a combined oven and grill, with a separate steel sink served by a lever mixer tap, plus a handy flip-up worktop extension. Storage is a compromise, with what looks like the main cupboard actually the gas cylinder locker. There’s just the one overhead locker, too. You might easily find the wardrobe, directly across the corridor, and set above a three-way fridge, sees action as a food storage location, still leaving plenty of clothes locations at the back in the high-level lockers (all with easy-to-operate positive catches) and the settee bases. 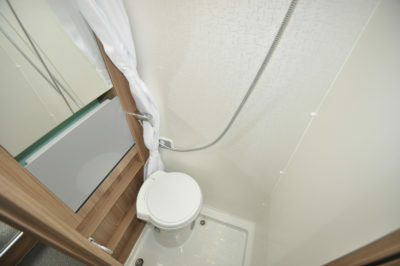 The washroom makes the most of its compact dimensions by incorporating a fold-down sink and a swivel-bowl toilet, with the whole room being used for showering. As for the rear lounge, the settees are long enough to be considered for single beds at night, or you can fill the whole area with a double bed by pulling out the seat bases. In daytime mode, you can throw open the back doors and enjoy great views out (plus fresh air in), plus there’s a choice of tables to sit on – the single pedestal leg; larger rectangular, or smaller round. Overhead, lockers with positive catches line each side, and there’s three-way access to each settee base. In standard trim, the Select 122 comes with Fiat’s two-litre, 115bhp engine, allied to a six-speed gearbox. 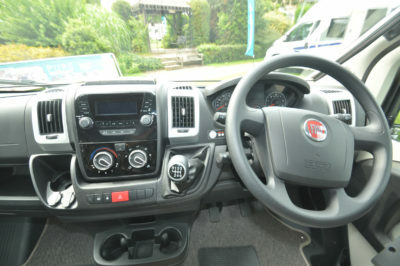 There is, however, more than a sneaking suspicion that most Select 122s will end up on the roads with at least the Driver’s and Lux Packs – the former including the 2.3-litre, 130bhp engine, cab air conditioning and more; the latter covering alloy wheels, digital radio, solar panel, reversing sensors and, again, more – meaning a realistic start price is in the region of £45,500. The model reviewed here also sports the metallic paint option, which takes the price up to the £50,000 mark. There are also options to enhance security and safety. Swift Command is a pre-installed Thatcham Category 6 approved proactive tracking device with the option to subscribe, which will lead to a good discount on your motorhome insurance. The app-based vehicle management system also allows owners to activate many of the vehicle’s habitation functions remotely; and Connect Direct is an online customer service account. So, Select lives up to its name, considering the choices on offer. Just keep an eye on the price, though. 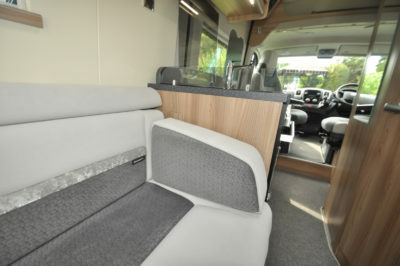 There’s more information on the Select range on the Swift website www.swiftgroup.co.uk. Find out more about insuring this or your current motorhome on our motorhome insurance discounts page. Safety & security Electronic immobiliser, remote central locking, ABS and EBD, EBA (emergency brake assist), twin airbags (with Drivers Pack), smoke and carbon monoxide alarms and Swift Command tracking system. 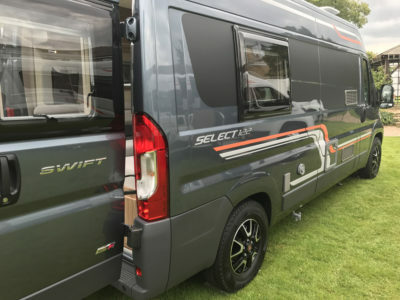 *Motorhome insurance cost based on Swift Select 122 motorhome retailing at £42,420 with electronic immobiliser and Swift Command tracking system. UK travel only. Kept on driveway at home at TD9 8ED. Motorhome owners – professionals over 50 years old with no claims, convictions or health conditions in last 3 years. 4 years no claims bonus mirrored from car policy and 2 years motorhome driving experience. Members of motorhome club doing less than 5000 miles annually. £350 excess applies. Premiums include insurance premium tax at 12% and are correct at 18.10.17.